On the wrong side of the camera « "TeresaBruceBooks"
Don’t be nervous. This’ll be fun. Your hair looks fine. No, the questions aren’t hard. Sure, that outfit works on camera. I’m not proud to admit I served up these platitudes to countless interviewees back when I was a reporter and anchor at the PBS affiliate in Beaufort, SC: WJWJ-TV. And when I left the newsroom to make public relations films in Washington DC, I re-warmed those same tired sayings to ease the anxiety of corporate CEOs and newly minted spokespeople. Today was payback. 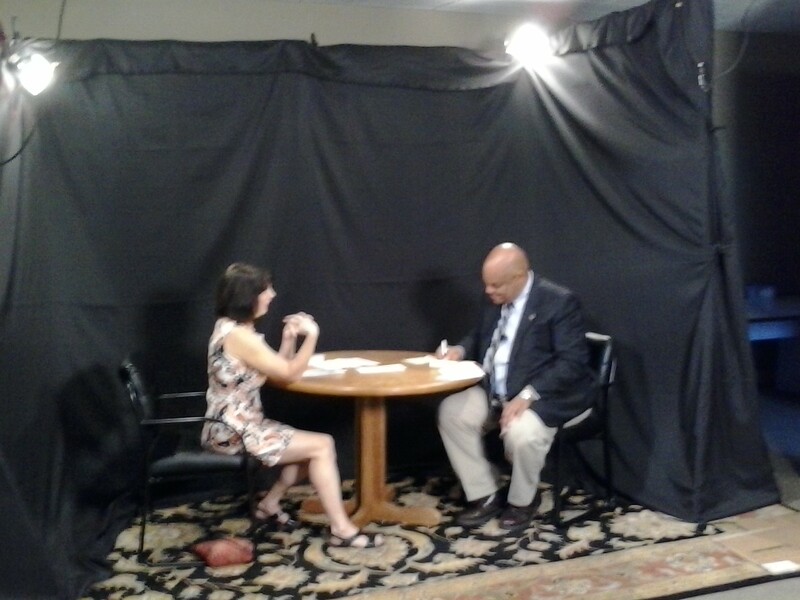 I found out what it’s like to be on the wrong side of the camera because my former co-anchor and friend Juan Singleton interviewed me for the TV program he now hosts for the City of Hardeeville. I knew this day would come. I’m grateful for the chance to introduce new audiences to “The Other Mother: a Rememoir” because I believe in the book and want it to be a best-seller for Joggling Board Press. I’m eternally grateful that my first TV interviewer was Juan, instead of a recent J-school graduate who will probably never read the book or care about an octogenarian dancer who started out doing burlesque in the Great Depression. But it was still waaaay harder than I thought it would be. First of all — where is it written that I look nothing like I did back in my anchor days and yet Juan Singleton hasn’t aged a day? Second — I’ve ditched more than my blond, anchor helmet hair. I no longer own any TV-friendly suits in bold colors. That purple suit in the top photo? It belonged to my grandmother Nellie — who turns 90 this December. A tad out-of-date, wouldn’t you say? Now it’s not like I’ve completely forsaken my TV identity. It was really helpful in my Ogilvy days — I actually enjoy “media training” clients. And when I’m not writing books and screenplays, I still use my reporting skills for simulated news programs for clients like the Department of Homeland Security. Those gigs are for “field reporting” — and nowadays reporters can even get away with wearing leather jackets. But for Juan’s interview segment, I had to be an author. And I realized as soon as I got on set this morning that there was a good reason I always told guests not to wear black. It disappears on camera, especially when the backdrop is Charlie Rose serious. Suddenly forced to go sleeveless, the only thing more mortifying was realizing that my dress showed just as much bare leg as bare arm on the two-shot. I’d fire me, if I gave anyone that kind of wardrobe advice. Once the cameras started rolling, I tried to forget about my various wardrobe malfunctions and concentrate on my message. I’m one of a long list of writers reading excerpts from their books at the inaugural literary festival called a “Novel” Wine tasting” at September Oaks Vineyards in Ridgeland, SC on October 26th. Phew, I managed to get that out in one sentence. Although my husband Gary, who was sneaking pictures during my interview on my cell phone, says I talked about twice as fast as my genteel, Southern born-and-bred host. It was Juan’s open-ended questions that presented a bigger challenge. 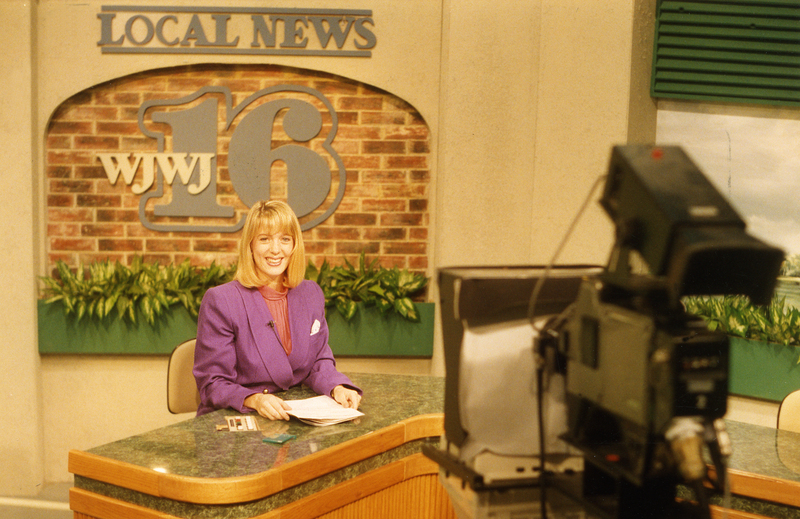 I was a master at those too, back in the WJWJ day. We all were. I think Suzanne Larson set the world record for asking one, strategically open-ended question and letting the interviewee answer for something like 17 minutes straight. We all loved it when a Byrne Miller Dance Theatre concert was coming up. You just had to introduce Byrne and she’d seduce the cameras, and our audience. But I knew Juan’s entire segment was supposed to be about 7 minutes. Suddenly this process I’ve always brushed off as easy, wasn’t! How was I supposed to describe what an Other Mother is, how I met Byrne Miller, what she meant to me, why I wanted to write the book — in just 7 minutes? The same queasy nerves that attacked right before my TEDx talk in Charleston threatened to make an appearance, until I remembered one my favorite Byrne Miller womenisms. It was TV, not brain surgery. I wasn’t being summoned to testify in front of a senate subcommittee. Juan Singleton was not the late Mike Wallace, going for the jugular. He just wanted to know more about a woman I loved enough to write a book about. (It turns out Byrne taught him a dance class or two back in her days at Beaufort Elementary.) I took a deep breath. Nobody would know if I messed up a detail from the book; that’s the beauty of becoming the expert in all things Byrne Miller. I could rely on my old TV instincts and just tell the story. Which is when another of Byrne’s womenisms popped into my head. This entry was posted in travel and tagged September Oaks Vineyards, The Other Mother, WJWJ-TV.